Rising AntiVirus 2011 is developed by Chinese software development firm, and can protect computers against all types of viruses, Trojans, Worms, Rootkits and other malicious programs. Ease of use, Active Defense technology, patented Unknown Virus Scan&Clean technology and patented Smartupdate technology make Rising Antivirus an ‘install-and-forget’ product which requires minimal user input. Zero-day computer security protection with Rising Cloud Security. Triple layers security defense structure of Rising Cloud Security 3.0 and, integrated traditional monitor and intelligent active defense functions. Advanced System Protection with File Monitor and Email Monitor. USB Disk Protection to automatically intercepts and deletes unknown Trojan, Backdoor, Worm, and other malicious viruses program while removable devices connect to computer via USB port. Trojan Defense where Rising Dynamic Behavior Analysis intercepts unknown Trojan, Backdoor, Worm, and other malicious viruses program on Windows operating system kernel. Rising System Kernel Reinforce intercepts unknown Trojan, Backdoor, Worm and other malicious viruses at real-time on web browser program. System Kernel Reinforcement with optional customizable methods of Templates and Custom, to detect, monitor, and intercept all malicious behaviors from viruses program and, reinforce Windows system kernel. Rising Anti-Virus 2011 has two editions – Rising AntiVirus 2011 Free Edition which has always been free since Rising AntiVirus 2008 Free Edition, and commercial Rising AntiVirus 2011 full version which costs $19.95. Here’s how everybody can get the downloads of setup installer of Rising AntiVirus 2011 version 23.00. 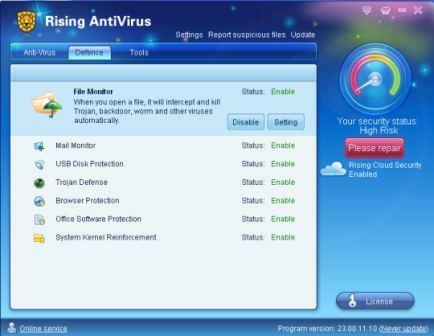 The trial version of Rising AntiVirus 2011 has a free usage period of 30 days, which can be downloaded from rising-global.com. However, in a joint promotion with PConline, a free 6 months version of Rising AntiVirus 2011 is available. Visit the following URL to download and install Rising AntiVirus 2011 with 6 months subscription license. No product key, serial number or activation code is required. On the page, just click on any “Download” button (with down arrow on green background) to start the download. During setup installation, select English to install the English version.